So I saw this recipe and since I am a huge peanut butter lover had to try it. It was so easy and it tasted sooooo good. It had a slightly different consistency from fudge that I am used to but was a very good treat. This time I hid a portion away before the kiddies gobbled them all down. I will wake up early in the morning and have these as an early morning pick-up when the house is quiet. This entry was posted in Recipes, ~Dessert, ~Food, ~Party, ~Snack and tagged butter, candy, chocolate, cook, desert, easy, ever, fudge, Peanut, Peanut butter, snack, treat, ~Food, ~Home. Bookmark the permalink. “Easiest Peanut Butter Fudge EVER | Country & Victorian Times” ended up being a pretty excellent blog post, . Thanks for stopping by Walter – come back as often as you can and find new articles of interest on a regular basis! 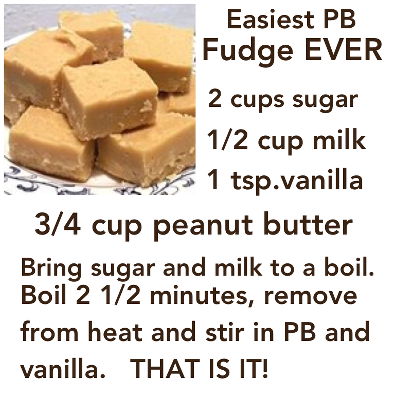 “Easiest Peanut Butter Fudge EVER | Country & Victorian Times”. Would you care if perhaps I reallyapply a bit of of your points? Please feel free to share – and if you would please leave a link back to the article used it would be appreciated! Victorian Times”. I will wind up coming to your website eventually. was in fact a truly great blog, . I hope you keep writing and I will continue to keep reading through! Country & Victorian Times”, do you mind in the event I personally start using a handful of of your ideas? Please feel fee – and if you would add a link back to articles used it would be greatly appreciated! This is really the 4th article, of your blog I actually went through.